Despite investment into alternative energies, oil is still the world’s most traded commodity. Want to know where it comes from? Here are the world’s oil exporters, ranked by revenue and global market share. Over 100 countries export crude oil, but the players at the top run the game. Many low-ranking nations represent less than 0.25% of the world’s market. For them, oil exports are better counted in hundreds of dollars than millions. To demonstrate the unevenness, consider this: five exporters make up nearly 50% of all oil exports. It takes 100 countries to comprise the other half. These are the top ten exporters of crude oil, ranked by earnings and their percentage of the world market. One thing you should know is that earnings are measured in millions of U.S. dollars. In other words, when we say that Kuwait’s export revenue is $30,700 million, what we really mean is that their oil revenue is over $30,000,000,000! When it comes to oil, Saudi Arabia is unmatched. 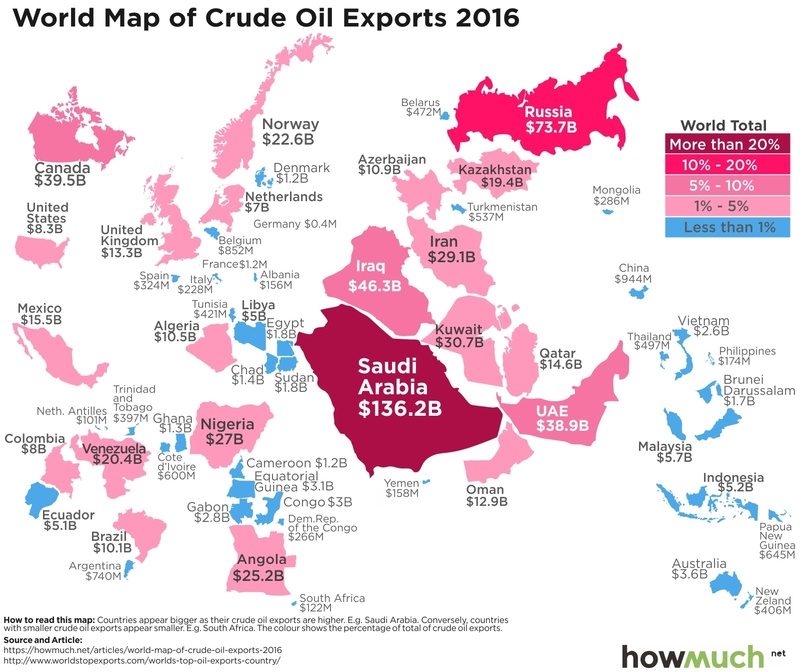 They command 1/5th of the world’s oil exports and earned almost twice as much as runner-up Russia, even though Russia is eight times bigger. As of this writing, Saudi Arabia is a hotbed of political uncertainty. The country has been inching closer to military conflicts against Iran, its regional rival, and the Crown Prince recently arrested several members of the royal family. Both could have an impact on their oil exports. The U.S. has a reputation for being an oil country, and rightfully so. Still, the data shows that our role in the export market is smaller than we might expect. Of all global exporters, the United States ranks 20th, behind countries like Angola and Kazakhstan. We own only 1.2% of the export market, and our biggest neighbors, Canada and Mexico, export much more oil than we do. Who is tomorrow’s big dog? Saudi Arabia holds the top spot, but their political instability could make them less attractive partners to buyers in the coming months. Meanwhile, Russia is making oil moves all over the world, and America continues to make its influence known. In the end, it may not be the oil itself, but national ambition, that determines the top crude exporter of the future.